FUTURES First Year Teacher Award program recognizes beginning teachers who exceed district expectations. All nominees are honored at a reception in the spring and each receives a certificate of achievement. Two are selected as the First Year Teacher Award recipient at the elementary and secondary levels. The 2018 FYT Award recipients were Melissa Diamond from Forest Lake Elementary School and Julian A. Gutierrez from Mainland High School. 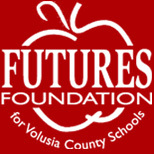 Each year, the Principal of the Year Award program, wherein peers select a recipient for the elementary and secondary levels, is facilitated by FUTURES. Mrs. Stacy Gotlib, principal of River Springs Middle School in Orange City, is the 2018 Secondary Principal of the Year, and Dwayne Copeland, principal of Starke Elementary School in DeLand, is the 2018 Elementary Principal of the Year. These announcements are made during a surprise visit by School Board members, Superintendent Tom Russell, district administrators, and FUTURES Foundation representatives. The Superintendent's Outstanding Achievement Award was initiated to honor support staff members who have demonstrated outstanding commitment, teamwork, cooperation, and innovation in the workplace. Debra Keese, registrar at Cypress Creek Elementary School, and Sherry Shepherd, school bus operator in the DeLand area, were named the 2018 Superintendent's Outstanding Achievement Award winners. 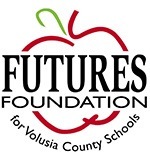 FUTURES works closely with the Volusia County School District on this important recognition program which honors a Teacher of the Year nominee from every public school. The recognition culminates in a 900+ person celebration each January wherein an overall TOTY recipient is selected to represent the entire school district. Our 2020 TOTY is Ian Jackson, AVID teacher from Taylor Middle-High School in Pierson, FL. The 2021 Teacher of the Year nominees will be honored at a Celebration on January 17, 2020 at the Hilton Daytona Beach Oceanfront Resort.